The Varicella vaccine, commonly known as the chickenpox vaccine is a shot that protects young children and adults from catching chicken pox, a contagious disease caused by the varicella-zoster virus (VZV). It is a very effective vaccine and helps in preventing the disease. At Apollo Clinic, we understand the uncertainty of illnesses as well as the importance of vaccines for adults. Therefore we are committed to supporting you and making sure that you receive the best medical treatment for all your health problems. Chickenpox is a highly contagious disease that is common among both, children and adults. It is usually mild but can sometimes cause more serious problems, especially in teens and adults. Thus, chickenpox vaccine is a must for adults. Blister-like rashes, itching, and fever. This can further lead to complications such as skin infections, pneumonia, joint inflammation, shingles, and encephalitis or swelling of the brain. Being a contagious disease, the chickenpox virus can spread from one person to another through direct contact with the fluid from the blisters or sometimes, even through the air. What is Chickenpox Vaccine and How Does It Help? The varicella vaccine, commonly known as the chickenpox vaccine is a shot that protects adults from catching chickenpox. The reason it is called the varicella vaccine is that the disease is caused by the varicella-zoster virus (VZV). The vaccine is extremely effective and prevents the onset of the disease. However, if you get the disease even after taking the vaccination shot, it will be very mild, and you will recover faster than those who have not been vaccinated. Who Should Get the Chickenpox Vaccine and When? All adults who have never received the chicken pox vaccination must be vaccinated against it. For this, two doses of the vaccine must be given at least four weeks apart. Also, it is essential to remember that if you have never had chickenpox or have been vaccinated against it; and you are exposed to chickenpox, being treated immediately will significantly reduce your risk of getting sick and will also minimise the risk of complications. The chickenpox vaccination fights against the disease. 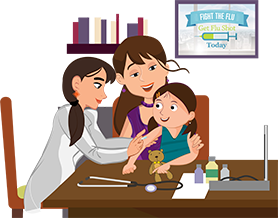 A few common side effects of the vaccine include swelling, redness or soreness at the site of the injection, a mild rash or fever. Some serious complications in adults include brain infection, seizures, pneumonia and loss of balance. However, most people who receive the vaccination do not have any side effects. At Apollo Clinic, we understand the uncertainty of illnesses and the importance of your health. Therefore, we provide immunisation services for adults, one of which includes the chickenpox vaccination that will help build the immune system and prevent you from chickenpox. Offering immunisations for adults, we aim at ensuring that you are safe from diseases and live a healthy life.